W-379 Heart-base Wedding Bobblehead Cake Toppers,If you are searching a Cake topper.We supply true 3D likeness and higher quality Customized Cake Toppers.This Heart-base Wedding Bobblehead Cake Toppers describe that The groom and the bride are standing on the rose hear-shaped base.The groom in black tie shut and standing with one hand in the pocket,the other hand is holding the bride who is in white wedding dress. 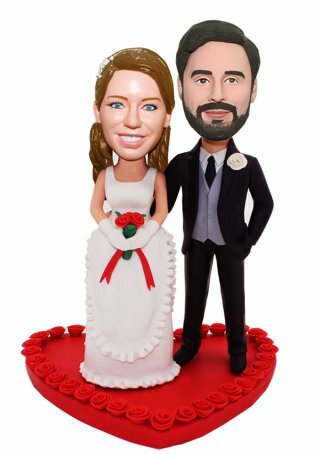 If you make it to resemble the happy new couple’s faces, it will top your wedding cake with lasting impression. 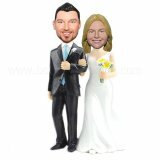 It’s not only a funny cake topper to savor your cake, but also a meaningful keepsake to decorate you house. I'm so excited about this cake topper. It was very easy to work with and kept me updated. If there was changes to be made she had no problem making them. Can't wait for everyone to see it on our wedding day.